M any states are now making it mandatory for employers to check the social security numbers of their new hires in order to check their immigration status. Employers are able to perform this function on their own, but many of our customers asked us to come up with a simple, affordable option to meet this new mandate. Checkright went a step farther, and combined the E-Verify service with an Online I-9 tool that enables employers to fill out their I-9 form and E-Verify their new employees in one easy process. The verification is instant on the internet and both the verification and the online I-9 is just $5 per employee. 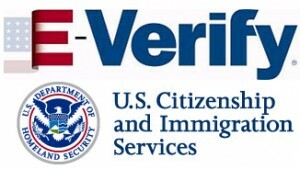 Click here to access E-Verify. Checkright encourages our customers to make use of our National Plus Package where for just $24, the employer gets E-Verification, Online I-9 Management, and a full criminal, sexual predator, Homeland Security, and known address and alias background check. You have put so much into your business-don’t let the wrong person undo your hard work. Click here for E-Verify and Background Checks. If this is the first time you have used either E-Verify or Background Searches, call our office and we will walk you through the set-up process the first time. After that, you perform the searches online any time at your convenience.